Since midterm results rolled in, candidates in several states have been pushing to count all ballots, hoping to turn losing elections into recounts. Georgians have been nervously awaiting the results of their gubernatorial election, where Democrat Stacey Abrams stands against Republican Brian Kemp, who’s been accused of committing widespread voter suppression. On Monday morning, the case against Kemp was calcified. One of Stacey Abrams’ campaign leaders, Lauren Groh-Wargo, took to Medium to tell the American public that over 30,000 ballots were found uncounted in the election. The Secretary of State’s website updated the public with the number of votes counted, as well as those cast throughout the election. Kemp, who was Secretary of State at the time, has said that only about 20,000 provisional votes had yet to be counted, with most counties totally accounted for. Kemp, his campaign and his office have tried to argue that mathematically, Abrams has no chance of pulling out a victory. Turns out that the Secretary of State’s office was lying. Abrams’ campaign grew suspicious when they noticed those supposedly finished counties were being updated with new counts online. That’s when Abrams’ team went directly to those polling places to find the truth. They found that the large majority of those 30,823 votes were provisional ballots from Democratic counties. Overseas military votes bring that total up to 33,507. As a result, the campaign has filed a lawsuit requiring that these ballots be counted. If only 19,000 of those are for Abrams—keep in mind that most are from Democratic counties—the race will head for a run-off on Dec. 4. There’s also the voter suppression reported in Georgia’s midterms to add to this equation. 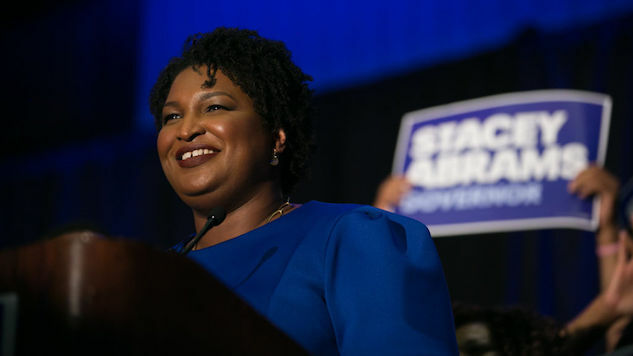 In their Medium post, Abrams’ campaign points to lines so long that voters couldn’t see where they began, along with “confused poll workers, conflicting and arbitrary guidance that varied widely by county,” as unnecessary electoral difficulties that essentially amounted to outright suppression. The Associated Press supports those claims, as they followed one woman who waited four hours to simply cast her ballot. Again, those conditions occurred while Kemp was still in charge of his own election. UPDATE: Giving further credence to the Abrams campaign’s contention that something fishy is going on, a judge just found that Gwinnett County violated the Civil Rights Act. U.S. District Judge Leigh Martin May wrote that the county violated the 1964 landmark legislation by rejecting absentee ballots solely on the basis of an omitted or incorrect birth year. The Medium post by the Abrams camp does not explicitly detail where these uncounted ballots came from, but given this new ruling, Gwinnett County is a pretty good guess.